The mechanics of walking are somewhat different to those of running. The different stride profiles of running and walking affect the power efficiency, maximum speed and impact level of the activity on your body. While walking and running burn roughly the same number of calories over the same distance and at similar speeds, the joint impact and muscle use that are involved in each type of stride are different. Your knees are bent more during a running stride than they are during a walking stride, and this increases the force exerted on the ground during running in comparison to the force exerted during walking. Increased bending of the knees also increases the force generated by your quadriceps muscles, also known as knee extensors.This is one reason why you might find running more tiring for your knees and quad muscles than walking during a comparable distance. An average walking speed is somewhere around 3 miles per hour, but fast walkers and power walkers can often walk at speeds at or above 5 miles per hour. The speed at which you feel more comfortable running than walking is known as your "break point," and a typical break point would be somewhere between 4 and 5 miles per hour. For most people, a running stride allows a higher overall maximum speed than a walking stride. One significant difference between running and walking strides is the length of time each foot is in contact with the ground. 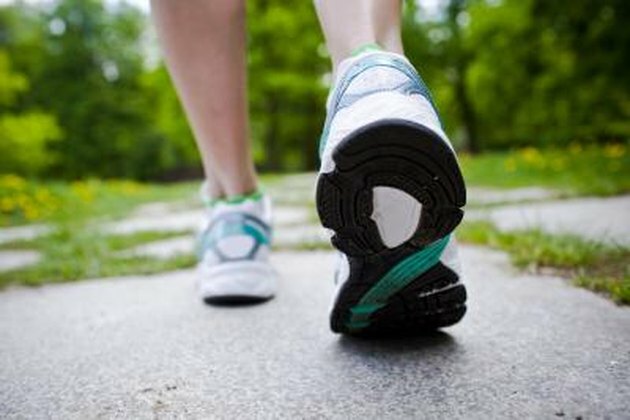 During walking, at least one of your feet will be in contact with the ground at any given time, and the length of time -- during each stride -- that each foot contacts the ground is greater. During running, the time each of your feet contacts the ground is minimal, and there is a period of time during each stride in which neither of your feet is in contact with the ground. The different strides used for walking and running affect the power used in executing each type of stride at different speeds. To take the example of a 220-lb person walking or running, the power efficiency of running or walking is similar around a speed of 4.5 miles per hour. Below this speed, a walking stride is more power-efficient than running; above this speed, a running stride is the most efficient.